inside the nyc schools fix | Welcome, reader! I'm John Lawhead, an ATR teacher in District 21, Brooklyn. Welcome, reader! I'm John Lawhead, an ATR teacher in District 21, Brooklyn. I’m utterly baffled by your celebration of Gov. Cuomo’s college classes in the prisons initiative and your choleric overreaction to dissenters. For one thing this program is simply the expansion of an ongoing program established with private funds in 2007 and is likely to continue as some kind of public-private partnership, in keeping with Cuomo’s relentless drive to reduce state services. Another thing is the timing of the announcement. It came two days after Assembly Member Karim Camara and State Senator Adriano Espaillat issued their Valentine’s Day statement of support for John King and the Common Core State Standards. This has led observers besides myself, including David Howard King in the Gotham Gazette, to surmise that Cuomo was offering a token of appreciation to Karim Carmara and the Black, Puerto Rican, Hispanic and Asian Caucus which he leads. Indeed the governor’s press release announcing the prison classes initiative quotes Camara praising the initiative as a “progressive investment in the future.” The impression of a quickly hatched quid pro quo seems further validated by the fact that Cuomo mentioned job training and better reentry services, but said nothing about college classes in his State of the State speech a month earlier. Apparently, the admins at the Badassed Teachers Association had to scramble to keep up with your personal interest in defending the governor’s initiative in order to make it organization policy. They posted a long compilation of material, some of it plagiarized from the ACLU website and Teaching Tolerance magazine without attribution. Apparently someone googled “school to prison pipeline” to get the stuff. Will there soon be a metric for measuring which schools send the most people to prison so Bill Gates can devise a intervention? There is not a word in this policy statement about the lack of jobs in this country. I don’t imagine the mass incarceration of Americans being significantly reduced without changing the economy. That seems like something to be figured out by organized working people rather than by philanthropic foundations and advocacy groups. In the meantime, the BATs become spectators, waiting for another good policy to applaud. I’m baffled, I’m bewildered and I’m sad. There is a painting on a wall in a gallery on the upper south side of Williamsburg, Brooklyn, and I was a friend of the man who painted it. Last Saturday on January 4, I approached the entrance with measured and contemplative steps and gazed a long while at the front of the gallery, the bridge down the road and the shops across the street, afflicted with the news that Raoul Sentenat is gone. Of course the other reason I walked so slowly was that there was a line to get in. To this she nodded knowingly, and without hesitation said, “I’m sorry.” There was an assurance about her, such that it couldn’t have surprised anybody she had already figured out that within this mildly elated Saturday night procession, a small and somewhat scattered troupe of mourners would also be trudging in. I listened without responding, and maybe I was more dull in the eyes or more forlorn at the mouth because she carried the talk forward, not like she thought she could brighten me up, but in a way that said she’d be damned if she was going to let the mood around her joint get any worse. It was time to go inside. I nodded my thanks for the open passage and all she was doing. As I winded my way through the first room I felt “spotted” by those who stood inside. Most of the people in the gallery were talking to each other and looking sideways at other people. Of course some others were making their way along the walls with what space they could find there. The exhibit Nation II at the Alamo at the Sideshow Gallery will have regular hours Thursdays through Sundays until March 3. It brought together art from about five hundred and sixteen local artists. I got stuck for awhile in different spots before making it to the painting. At those points I glanced up at the plethora of objects on display and wondered how many other unfortunate destinies the proprietor’s hard look had uncovered. Yet the success of her establishment in adroitly squeezing in so much art and serving wine to all comers surely amounted to a respectable civic gesture and it seemed improper or at least unfitting to detract from it. When I reached the second room I looked up and knew the painting I saw was his. It was hung at the top of the wall right against the ceiling. I could see why people found it disturbing and I could see that there was much to see in it. No title was given, so I examined it from scratch. It was surely not a face one would come across in the supermarket, but for me it did not look like a death mask. There was indeed a solemnity to the figure, but the eyes were not vacant. There was also a restlessness of the substance that composed it. It was more face-like than mask-like but not wholly one or the other. It was very mask-like in its round, ragged edges but face-like from the center and especially below the nose. The flesh was mottled, as if infested with something or just decayed. I noticed a color, maybe on the blue side of verdegris and maybe not, that might have been festive had it adorned anything other than this figure. A very pale and luminescent tone of this color rose above the brow of the figure in visible strokes. It also outlined the face with a thin halo. Beyond the outline it darkened deeply as it reached the edges of the canvas. To me the figure seemed to be wearing a helmet but it was not placed symmetrically or clearly defined. It might have been partly a helmet and partly more of the halo ascending strangely, but it did not make much sense for it to be both things. Whatever it was rose above the face, up to the edge of the canvas and out of the picture. John Elfrank-Dana at the Sideshow Gallery. Untitled oil on canvas by Raoul Sentenat upper center. John Elfrank-Dana had texted me from his place in the line outside. I was glad he would be joining me in what had turned from a look into a vigil. It was from Mr. Elfrank-Dana a few days before that I learned Raoul Sentenat had died shortly after Christmas. We planned to join Mr. Elfrank-Dana’s wife Teresa Nasarre when we came out of the gallery. Mr. Elfrank-Dana is the UFT chapter leader at Murry Bertraum High School in lower Manhattan which is where Raoul Sentenat worked during the last years of his life. I had known Mr. Sentenat when we were both teachers at Bushwick High School in north Brooklyn. We caught up with the rest of them in a crowded and lively tavern-style restaurant. At the table was Ms. Nasarre, Raoul Sentenat’s sister Rosee Camafreita, her daughter Monica and a longtime friend Mr. Renan “Leo” Arango. There were bottles of red wine about the table and scattered pieces of bread crust, olive seeds, squished sections of lemon, and other tidbits showing a company of people involved in a well-furnished repast. The light was buttery yellow and made me feel warm and cozy. I could see into an adjoining room and that the ceiling there was festooned with vines of philodendron and the shiny leaves showed glints of light. I sat across from Mr. Arango, a cheerful and wiry man with a protruding white goatee. As soon as we had introduced ourselves Mr. Arango assured me that his longtime friend Raoul Sentenat had spoken of me years ago at the time he had got to know me at Bushwick. He said him meeting me had been important. I thanked him for telling me that, but the zeal of his insisting on it caused me to remain noncommittal. I looked mildly quizzical as if I needed more assurances that he was someone who did not get his Johns mixed up. He smiled at me, wanting me to invite him to say more, but I cocked my head and said nothing, holding the mask of my grief in place. Around this time a large plate of fresh oysters on ice had been brought my way and with Mr. Arango assiduously attending to me, cocking his head mockingly like he was Lear’s clown, and the oysters sitting on the plate cold and delicious, the wood bark of my cheeks was dissolving into flesh. We raised our wine glasses and toasted Raoul Sentenat. The women smiled from their hearts at the assemblage of the troupe, after all its incidental mishaps, and one of them threw back her hair with a kind of merriment, and then they settled back to listen. We started to tell more stories. I told the story of an initial encounter with Raoul Sentenat when he had gotten angry with me. I had earlier shared this with Mr. Elfrank-Dana by email so it was easy to tell it now. I explained that we shared a classroom and one time I had shown up to the room too early and had broken the concentration of the class and in doing so provided part of the class with an excuse to bolt the room as though the period were over. Raoul Sentenat had dismissed the rest of the class and then gone about straightening the desks while fuming at me for what I had done. I said this unfortunate encounter was a strange contrast with how he was when we got to know each other, because as I didn’t need to tell anyone present, he was an unusually careful and polite fellow. 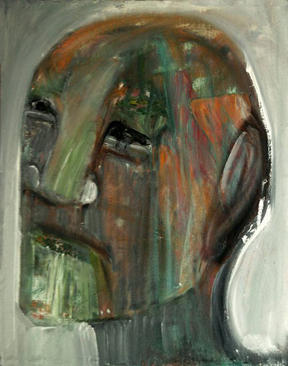 Philosopher, oil on canvas board, 2009. Courtesy of Raoul Sentenat. I contemplated Mr. Arango’s story and thought that it was far more interesting than mine. I could not help thinking about how Mr. Arango had to manage to forgive himself for snapping at Raoul Sentenat like that. It seemed like even in the future he might wake up too early on a weekday morning and have to think about it the rest of the day. On my side, it seemed less significant how Raoul Sentenat had lived down the incident with me. Now that his life was over the incident did not seem to matter much at all. So feeling a little vanquished and in token of such I prompted Mr. Arango to tell the Che Guevara story. He did so with alacrity and I was amazed at hearing the incident told so well because I thought I knew it by heart. Mr. Arango related how when Raoul Sentenat’s family was still in Havana in 1961, he was leaving a theatre and Che Guevara was standing outside. The commandante was watching the crowd emerge and there was something about the child that caught his eye and he approached Raoul Sentenat, picked him up and embraced him. I marveled at how well Mr. Arango had rendered the tale and applauded his telling with a heartfelt nod and smile. Then I looked around the table. Mr. Elfrank-Dana and the women were quiet and seemed content to continue listening. So I asked permission to follow with a story that I was reminded of by the Che Guevara story. With the company’s assent I began, explaining in the first place that this was an incident which had occurred at the time of General Lafayette’s visit to Brooklyn in 1824 when he was making a tour of all the States at the invitation of President Monroe. Lafayette was invited to be at the site where the old (now gone) Brooklyn Public Library was going to be built in what is now Brooklyn Heights. He agreed to be in the ceremony during which he would lay the cornerstone for the building. The school children were let out to watch the proceedings. Instead of waiting solemnly in the area where the ceremony was being held, they rushed into the large pit already excavated for the foundation of the building and began to play. A while later some of the men on hand, observing that the pit was full of large rocks and other debris and also anticipating the commencement of the ceremony, set off to bring the children to higher ground. Lafayette went with them and it was he who pulled up the five-year old Walter Whitman and carried him out. An “embrace” was what Whitman later described it as. The faces around the table were shining with delight. Mr. Arango’s smile was majestic and his eyes offered a congratulatory twinkle. There in the gentle fanfare of smiles and looks of approval, I took a swallow of my red wine and felt very uneasy. 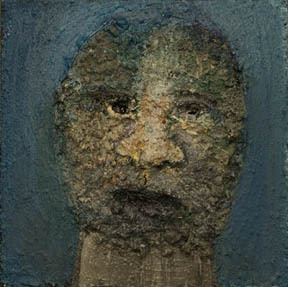 Awaken to a Sun that is Coal Up There, mixed media on wood, 2009, courtesy of Raoul Sentenat. It was not because the talk was moving perilously close to becoming a Cultural Exchange or at least not only that. At first I thought the main thing might really be because I had thought of how the general had lived on another decade, reaching his eighth one after seeing his third revolution at close hand, and that the commandante had not reached his fifth decade when he fell, and had seen only one revolution, and that one not very well finished. Also, in the same way, while old Walt had sauntered into his eighth decade before his demise, Raoul Sentenat had barely reached his seventh. But also, as I was indulging in all this regretting, I might as well feel sorry for general because while most people know who Che Guevara is he has become just the name of a town, or a school, or if we’re lucky, depicted mutely in stone, tiny in the distance, and further diminished by the bulging physique of the war steed he is mounted on, waving his sword around. It looked like old mad Walter was coming out the winner of this reflection. But then I knew it was something entirely different that disturbed me. I was thinking back to something Mr. Elfrank-Dana and I had been saying just before we reached the restaurant. It was that Mr. Elfrank mentioned a matter of substance in the story of Raoul Sentenat and I had answered him with a generality. Turning the conversation over in my mind, I began to feel more vapid and foolish than the woman on the step could have been. Mr. Elfrank-Dana had told me that he had tried to get the man excessed from his own school. Outside in the cold air we made a circle of six at the corner of Bedford and Metropolitan and we smiled at each other and at the success of our pilgrimage. I offered to drive Ms. Camafreita and her daughter home. On the long approach to the ridge up Vanderbilt Avenue we chatted and marveled at how beautiful the old wood-frame houses and stable buildings looked in the darkness and snow. Then we ascended the ridge to one of the sainted streets of Prospect Heights and I dropped them at the corner. They thanked me again for being there that night, and I thanked them again for the wine and the oysters and drove away, around the circle, down out of the woods and toward my solitude, host to my grief, and anyone following this story should know it was a reunion I relished. For my grief was not an upright tower that swept its beam at the horizons, but a low, mean and twisted thing biting my heels and stinging me about the head and burned away my vanity and guilts, and made me whole again, wanting to attend better to what matters. 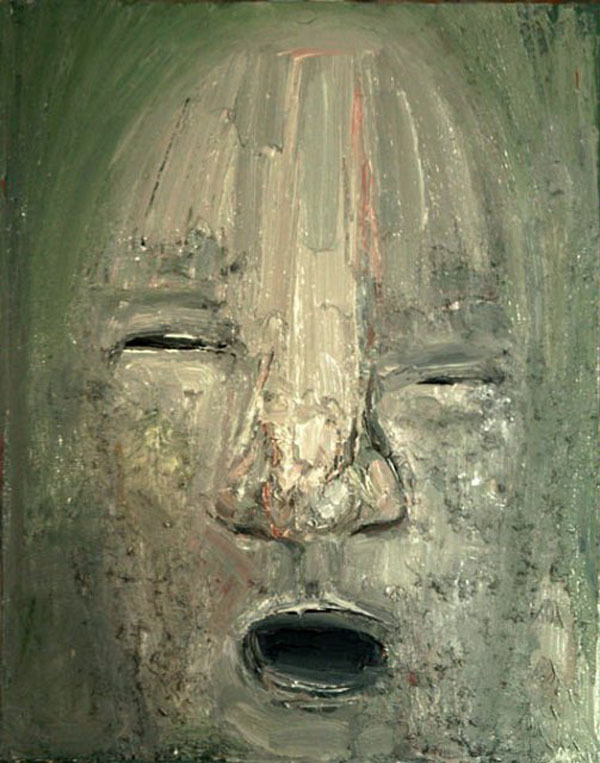 Scream (After Eye Surgery) oil on canvas, 2009. Courtesy of Raoul Sentenat. Mr. Elfrank said the best hope for Murry Bertraum would be to have a principal who acted as a buffer to ameliorate the mandates of Race to the Top and the new teacher evaluation law and find ways to let teachers make their jobs manageable. The current principal, Lottie Almonte, has resisted responding to demands made collectively. After several dozen teachers recently signed a petition asking for better guidance for what teachers were required to do under the teacher evaluation law, she started summoning the signers one by one to her office to discuss the issues raised in the petition. Lottie Almonte was previous removed from a small high school in East New York and then spent several years working for a Children First Network. In that capacity she became closely involved with the administration of a small school in the Franklin K. Lane building, Multicultural High School, at which I taught for nearly a year. Before the time in September 2011 when the principal, Altagracia Liciaga of Multicultural was removed for misconduct I had observed Ms. Almonte providing her with support in the harassment of teachers. Teachers were frequently summoned by the principal for meetings with no stated purpose. When I challenged the principal to state the purpose of a meeting she was requiring me to attend, Ms. Almonte who was present in the room said, “the principal can meet with a teacher anytime she wants.” She implied, though she did not say it, that no reason needs to be given. Based on her history of intimidating teachers, a Brooklyn district representative, Anthony Sclafani, advised the school chapter at Multicultural to pass a resolution asking the school and network to refrain from allowing Ms. Almonte to conduct observations of any teacher in the school. This resolution passed with only a single dissenting vote. Following the resolution the network acceded to the demand. Mr. Sclafani was often present at school chapter meetings encouraging members to come forward to report incidents of harassment. The principal had to apologize after Ms. Almonte improperly attended a grievance hearing in order to assist the principal. The principal was removed after many months of complaints of misconduct including decisions that put students’ safety at risk. The investigations that eventually found misconduct on the part of the principal failed to duly implicate the network support the principal had received. Despite Ms. Almonte’s checkered history the Manhattan UFT district representatives afforded no guidance or support to Mr. Elfrank-Dana in dealing with his new administration. The gross disparity in the level of involvement and protection offered by district reps in Brooklyn (Charley Turner, another Brooklyn district rep sometimes accompanied Mr. Sclafani to buck us up at Multicultural) and their counterparts in Manhattan strongly suggests that somebody in the Manhattan district office had pulled out a catch-29 for Mr. Elfrank-Dana from the UFT’s unwritten Favoritism Clauses. I wrote an email to the man who had been Raoul Sentenat’s best friend at Bushwick High School. His name is Dirk Leach and he now lives in the woods of northern Wisconsin. 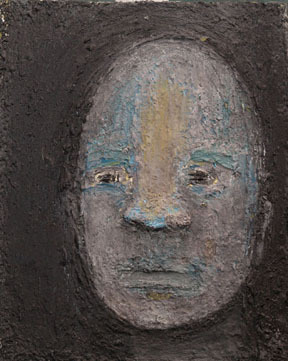 Mr. Leach is a painter now and exhibits his work in local galleries. 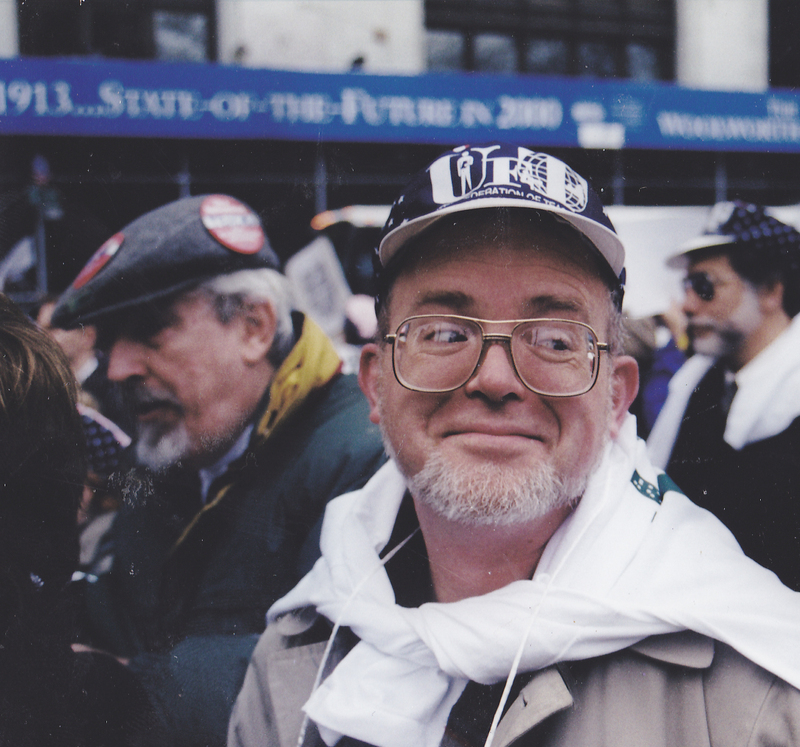 Dirk Leach at a UFT rally in lower Manhattan circa 2002. One thing that made it easier to give Mr. Leach the bad news about Raoul Sentenat was that it allowed us to catch up each other with our other news and we were way behind on that score. It provided solace from the remorse I felt in having let a lot of mail from Mr. Leach go unanswered, though it did nothing to ease my remorse at not having kept up with Mr. Sentenat after he was exiled from Bushwick High School along with most of the rest of us. I had been thinking about Raoul Sentenat’s life as a story about what affects the rest of us. I was still feeling sorry about having hesitated to ask about the specifics of Raoul Sentenat’s school situation when I was with Mr. Elfrank-Dana on Saturday. Still I used the time on Sunday and part of Monday to catch up with Mr. Leach and see if he could tell me more about Raoul Sentenat’s art. 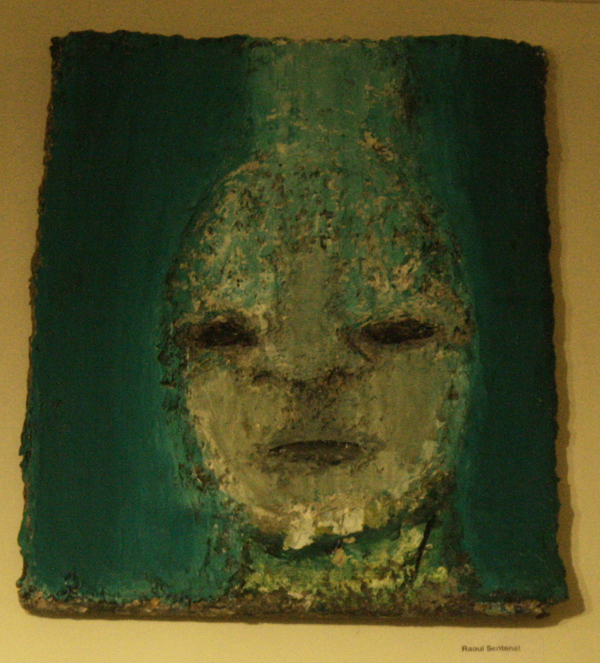 Untitled, mixed media on canvas board, 2013. Courtesy of the Sideshow Gallery. I had at first emailed Mr. Leach a photo file of the untitled painting at the Sideshow Gallery. In response Mr. Leach noted that the figure in the painting resembled Xolotl, the Aztec god of fire and death. I found this useful for seeing the painting. I noticed the figure did have a god-like bearing and that the shape at the top of the figure was probably a headdress of feathers which is a feature of one of the forms that Xolotl assumes. I could also see something happening in the painting, or at least the sense of something happening. It’s the arrival of a towering presence. In the face and the eyes there is a look of attentiveness. Xolotl must guide the dead to the next world. The attributes of this god include strong guardianship. Xolotl in the form of the dark star guides the sun through the underworld. Raoul Sentenat spent almost fifteen of the last twenty years mostly using photography to create art. He used cameras to create abstract “found” objects that he encountered around his neighborhood. He used close-ups to present abstract and unusual patterns of common things. 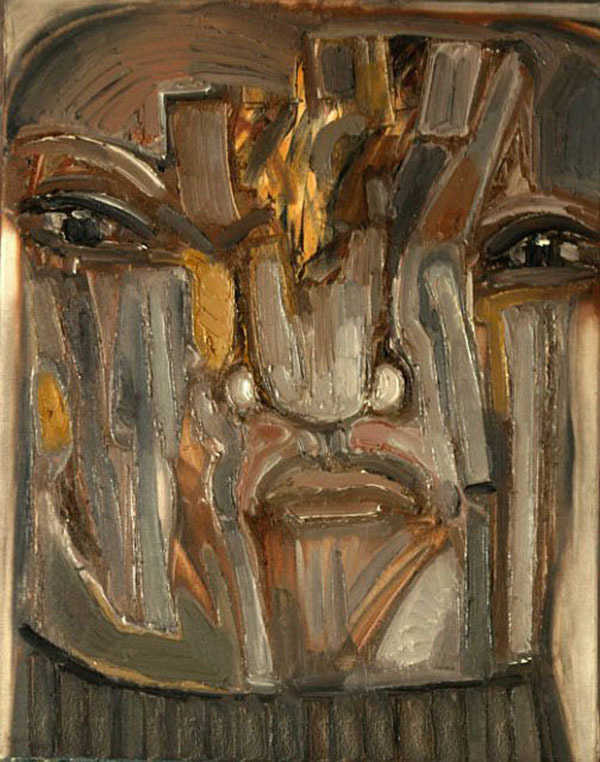 In the last five years he had developed a fascination with masks and faces. Reading this passage on Raoul Sentenat’s website which includes galleries of paintings, including those presented on this blog, made me think about how much art is more than producing objects but also observing and seeing. Moscoso III, acrylic on canvas board, 2011. Courtesy of Raoul Sentenat. I grieve the loss of Raoul Sentenat and I also grieve the loss of the old Bushwick High School school community with a varied mix of people thrown together and forming a community based on the common toil we did. Sony Grandoit, and his sister Elsie, and Pedro Sierra were teachers in the school who had grown up on the blocks near the school. Others like Dirk Leach, Maribeth Milkowski and Stephen Haff had grown up in the Midwest. 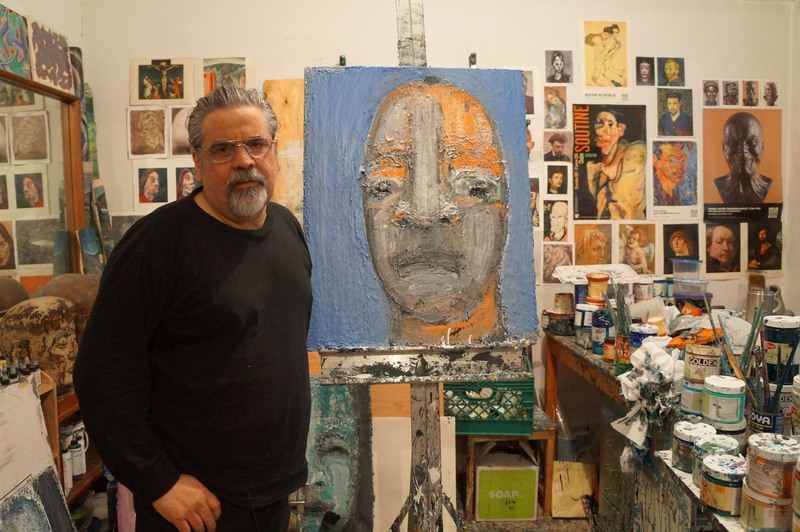 William Powhida was an artist also and one of the youngest teachers, and like Susana Giberga, Jonathan Phanstiel and others he had grown up in other neighborhoods of the city. Then there were others who like Raoul Sentenat had come from abroad. One of our teachers was Bahraj Seepersad. Mr. Seepersad had been president of an independent teachers’ union in Guyana, and participated in organizing a general strike against the Forbes Burnham government. After that he had gone into hiding. Unable to return to a regular job he became a smuggler for several years, hauling food stuffs from Suriname to sell on the black market. He was gentle man, devoutly Hindu. I somtimes visited him at his small house in Ozone Park, and enjoyed talking with him and having a beer. I loved hearing these stories about his life before coming to the U.S. The varied faces of the old school included the bright look Raoul Sentenat would give me when I saw him in the teachers’ cafeteria. It was saying, come over here! Share something new with me! Welcome to the Catch-29 blog. I am bringing out the dead. How is that for a civic gesture? I am bringing out Ms. Cordero who welcomed me to Bushwick and adopted me as if I were her own winded and still eager son and left ESL materials for me in the Main Office (wonderful stuff to be used over and over). I am bringing out Mr. Marvin Clanton whom I knew and loved as the gentleman teacher of Bushwick High School, a man with the soft tones of Appalachia in his voice whose heart failed him one weekend after an assault on his person. I am bringing out old Mr. Harold Clines who collapsed on the J train where he was headed back to the building where he was born on Hale Street, leaving me with the shock of knowing I was probably the last one he’d spoken with at any length in the old teachers’ Room 321 at Bushwick, and who was carried to St. Michaels Church in East New York where we heard the priest say the Clines’ were a founding family in the 1860s. I am bringing out Mr. Joseph Capazello, the first teacher I ever represented to the school administration as newly-elected chapter leader at Samuel J. Tilden High School and who loved to fly radio planes over the desolate wilds of Floyd Bennett Field. I am bringing out Mr. Eugene Prisco, union activist, candidate for Congress, compulsive jokester and public advocate. I’m bringing out others not named, and the child become painter and the child become poet. I’m bringing out Mr. Raoul Sentenat! The printed and bound book — but the printer and printing-office boy? The well-taken photographs — but your wife or friend close and solid in your arms? The black ship mail’d with iron, her mighty guns in her turrets — but the pluck of the captain and engineers? In the houses the dishes and fare and furniture — but the host and hostess, and the look out of their eyes? Raoul Sentenat in his studio. Photo courtesy of Moncia Camafreita.